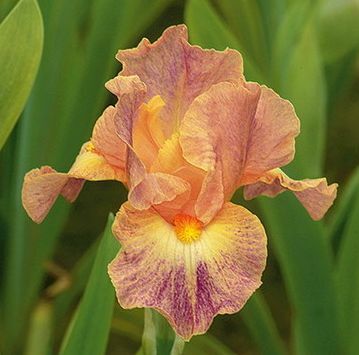 'Paisley' (Marky Smith, R. 2003) Seedling #98-30A. IB, height 23" (58 cm). Midseason to late bloom. Standards smoky mulberry brown shading to brass edge, gold at base; style arms gold, slightly smoky between midrib and edge; falls indian yellow (17B) washed mulberry to smoky violet at end, cream center; beards yellow with hairs tipped red at end, vermilion (33A) in throat; ruffled; slight sweet fragrance. 'Flights Of Fancy' X 'Denali', Aitken 2005.